Time Management is a critical capability for individuals as well as senior leaders. Leaders are often under pressure to allocate adequate time on strategic priorities. There isn’t a one-size-fits-all formula designed for appropriate time management that works for all executives. However, research on the practices utilized by the leaders effectively managing their time reveals that that they assign a significant percentage of their time in meeting external and internal stakeholders. Specifically, they were allocating two-third of their time in making key business decisions, engaging and motivating people, setting direction and strategy, and managing external clients. Leaders stressed with time constraints can immensely benefit from the Principles of Executive Time Management. Application of these principles vary from executive to executive and from situation to situation, but they provide effective measures to manage time appropriately. The first principle in managing the executive’s time warrants budgeting time for priority initiatives and following a methodical process on its allocation. This step entails avoiding random assignment of executives to engagements and, instead, encouraging regular assessment of leadership time and involvement requirements for each project. The task also includes an evaluation of each executive’s commitment on all tasks—such as key initiatives, engaging and coaching team members, and meeting clients. The analysis uncovers the breadth of leadership available in an organization to drive its strategic initiatives. The time budgeting exercise also allows the companies to halt pursuing new projects once the leadership capacity runs out, and lessens the leaders’ administrative responsibilities until this leadership constraint is managed. To resolve the human resource constraint, organizations can set up governance committees to administer time budgeting for strategic projects with a mandate to review and approve them, and plan time commitments required from the leadership and each leader’s availability. The time required to involve, coach, and direct employees is critical in developing the managerial span of control. Inability to set the managerial span of control right can leave the organizational structure inefficient. The managerial span of control is typically viewed from a structural perspective: the broader it is, the smaller the number of managers required and hence the lower operating costs. The spans of control should strike a balance between not too broad or not too narrow. Getting this balance is critical, since too lean organizations crush the managers with more direct reports than they can possibly manage effectively, whereas too many managers drastically add towards complexity and unwarranted tasks (e.g., unnecessary meetings). Restructuring the department or business unit with a skewed managers-to-subordinates ratio helps eliminate unnecessary work and meeting culture. Similarly, transforming internal governance structures aids in saving significant amount of executives’ time (annually), enhancing strategic focus, and increasing accountability and decision making. In addition, the leadership should work on simplifying the decision-making process by eliminating multiple boards, authorities, and unnecessarily detailed discussions, to improve the executives’ time management. Interested in gaining an understanding on the remaining 3 principles of Executive Time Management? 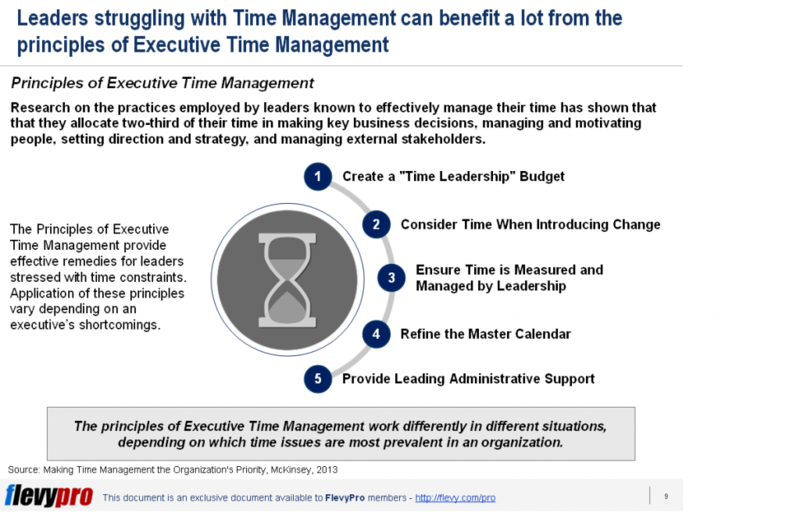 You can learn more and download an editable PowerPoint about the Principles of Executive Time Management here on the Flevy documents marketplace.